It’s that time of year again. The holiday season is here. 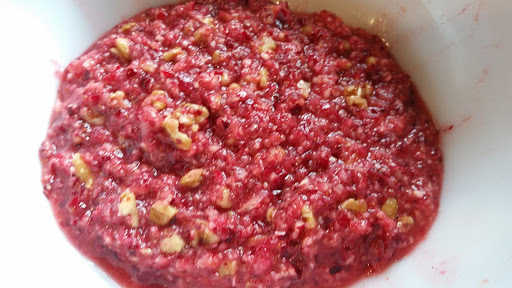 One of my mom’s favorite holiday dinner side-dishes was Cranberry Salad. This is her recipe, and while I would prefer something without jello, I just can’t bring myself to break her tradition. 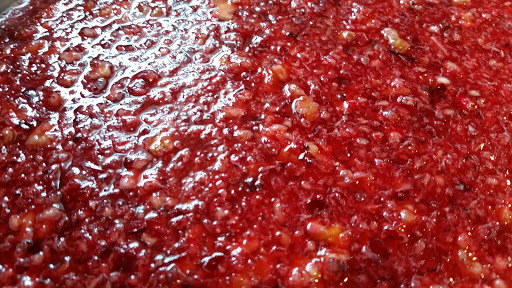 In a food processor, pulse the cranberries and orange until finely minced. Place in a large bowl and add the pineapple, sugar, and walnuts. In a small sauce pan, bring 2 cups of water to a boil. Remove from heat and add the strawberry jello whisking until completely dissolved. Add 1 cup of cold water and stir well. Pour this into the cranberry mixture mixing well. Pour into a 9 x 13 dish and refrigerate overnight. My aunt also used this recipe but she used one strawberry and one orange jello. She also substituted pecans for the walnuts.